Street choirs, campaigning choirs, share your events, music and ideas here! You can now pre-order our book! Click on the cover to go to the publishers’ web page. 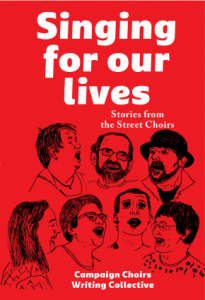 We’ll be launching it properly at the StreetChoirs Festival in Brighton on the last weekend in June 2018. Girls Just Wanna Have Fun-Damental Human Rights from Mark Latimer on Vimeo. Links to participating choirs and their brief details – and a form for your choir to join us. Most important – a contact form for you to use to add your contributions and comments.